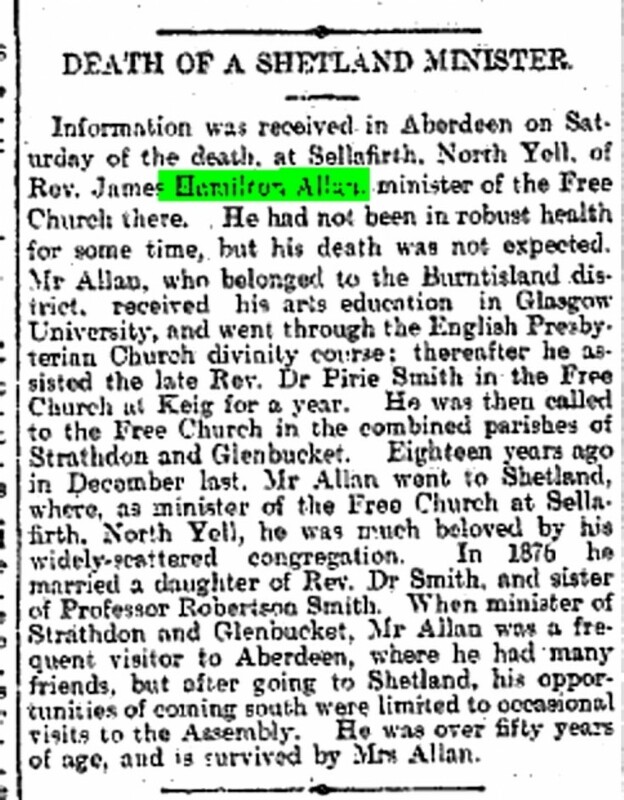 In my papers I found an obituary on the Free Church minister James Hamilton Allan. ....."When minister in Strathdon"....refers to the reason why he was translated to Yell. This happy-go-lucky lifestyle was more than his calvinistic flock could endure. My gr.-grandmother Alice Thiele Smith in her reminiscences wrote that it was his congregation that wanted to get rid of him. The presbytery took him off the streets - so to speak. Alice called him a rogue. This especially, as - when assistant of his father-in-law to be - he first proposed his wife's youngest sister Lucy. But while Lucy along with Alice was in Germany for a while, he proposed Nellie. When Lucy received the "good" news of the planned wedding, she nearly got ill from grief. Well, that's a bit of family gossip, but surely will do not any harm to anyone nowadays.